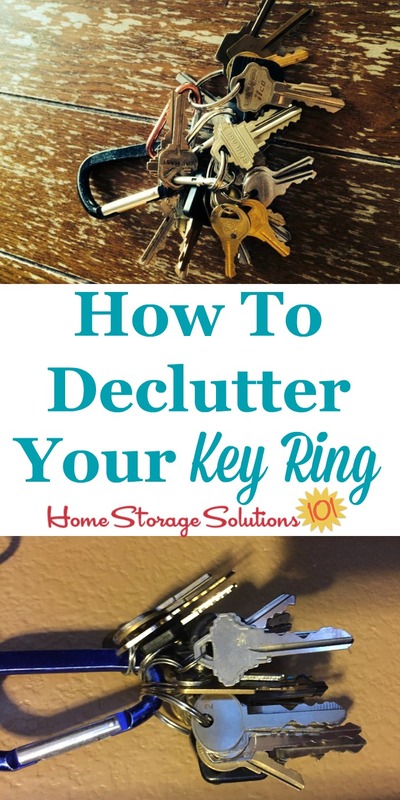 Today's mission is to declutter your key ring and loose keys around your home. This mission is designed to be done while working on the Organizing Purses & Handbags Challenge, which is part of the 52 Week Organized Home Challenge here on this site. This mission is, overall, pretty self-explanatory, but will definitely keep your purse decluttered. Here are various steps in the task though, to help you along, none of which I hope will take you too long. The first step is to get rid of some of the keys on your key ring, if they are no longer useful. BUT, do you really need all the keys that are on your key ring right now? Perhaps some of them are not used regularly and instead of carrying them around everywhere, and possibly losing them or having them stolen, it makes more sense for you to remove some of them and put them on a spare keyring somewhere accessible for the infrequent times you do need them. Or, perhaps you've just been adding keys to your key ring for years, but never removing any. Ask yourself, do you really know where all of those keys are supposed to be used? If not, does anyone else in your home know what they're for? Removing the excess weight from these keys from your regularly used key ring will lighten your purse, and also make your car happier, not to have all that weight pulling on the starter ignition mechanism of your car! After you've winnowed down the number of keys to those you use regularly the next step is to remove other excess items from your key chain. The thing that most people have on their key chain beside keys are loyalty cards. I've written an article on how to organize loyalty cards, and the article itself talks about ways to organize both the cards physically, and also discusses briefly using an app for this purpose if you choose. Not everyone's "mystery" keys are on their key ring. Instead, almost everyone has a key or two they've run across, from time to time, and wondered, hmmmm, what they heck does that go to? These keys may be in any part of your home, such as your kitchen junk drawer, stashed in your garage, or who knows where. To the extent you know where these keys are now, go ahead and gather them up today and deal with them. If you feel comfortable go ahead and declutter any of these keys as well that you know are just useless now. Do this same thing as you come across other unknown or mystery keys while working through the Declutter 365 missions here on the site. Below I've got more hints of what to do with the other ones as well that you come across, but aren't sure if you should declutter yet or not. Here are some photos above, sent in by readers who've already done this mission. The top photo is from Julie. She said, "As a result of decluttering all the drawers in the kitchen this is all the loose keys I've found. I put them on a key ring and put in the garage. If we make it a year without needing them, then I'll throw them away. No idea what they go to :( "
The photo at the bottom of the collage is from Tamara. She said, "I have also been adding found keys to this ring. When I am done with this decluttering I will walk my home and then get rid of the ones that no longer have a purpose." 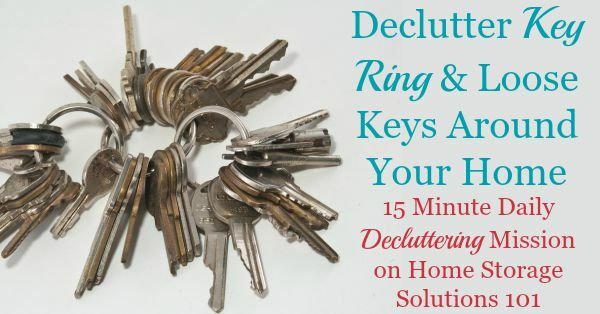 Once you've gathered up all the loose keys you've just placed around your home over the years, and decluttered the ones you know are useless now, the question is to figure out what to do with the rest of them. This is where hopefully your household's collective mind is better than just yours, by yourself. Ask others who live in your home -- what is this key for? Hopefully this will solve some of these mysteries. Then, the next step is to tag or label each of the keys that you either know what it's for, or figure it out, so that you don't do this same mental gymnastics exercise in six months. Also, get yourself in the mind set, from now on, when you acquire something that has a key, to go ahead and label it right then! This just works with the way we really are, as human beings. When we stash a key somewhere at the time we think, I know what that's for, and I won't forget. But, ummmm, we do. So tagging and labeling is so important to keep from having these mystery keys again in the future. In addition, you have to consider that there may be times you aren't there to answer someone's question about "what is this key for?" So labels and tags also help others in those types of situations. 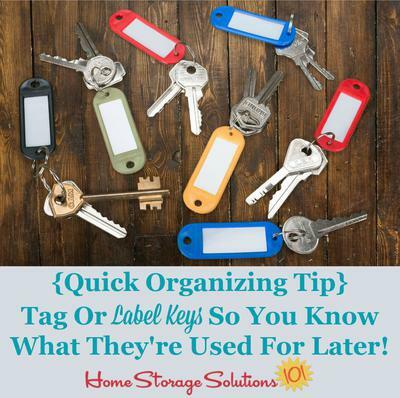 Once the keys are all tagged or labeled, I suggest keeping them all in one location, such as a small drawer or on key hooks, just so if you need a key you have one place you need to go to look for them, instead of looking in five or six possible locations. Of course, there are always security issues to consider for anything which needs a key -- if it didn't need to be locked up you wouldn't have a key for it -- so it might make sense to keep certain keys somewhere beside this central location. As always you just need to consider the pros and cons of doing things various ways, knowing yourself and the security risks, and make a decision which works best for you. So that's today's declutter mission! Once you've done it I'd love to hear about (or see) your results. So if you declutter a bunch of keys or other items off your key ring, or from your home, you can send in your photos here and the best ones will get featured here on the site. 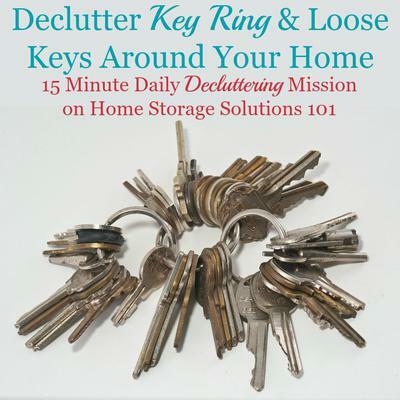 I hope this mission has inspired you to get rid of your key clutter.